Easy to make. Wonderful to enjoy. This raspberry compote layers the flavors of sweet, tart, Grand Marnier plus additional orange flavor from an orange peel. 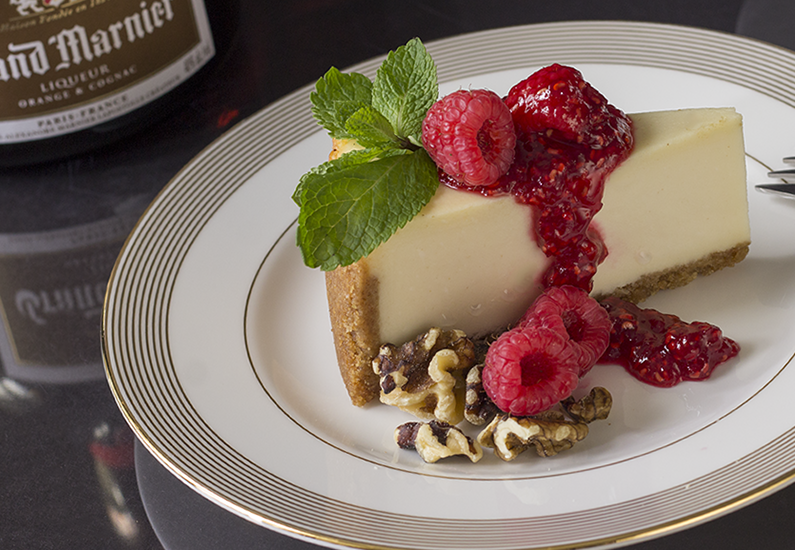 It was made especially for a New York style cheese cake (Recipe not included.). Still, it's versatile and can be served on many fabulous dishes such as crêpes Suzette, regular pancakes, vanilla ice cream and more. Need a hostess or holiday gift? What better way to show your love than with a homemade raspberry compote with Grand Marnier in a lovely jar! Yields 1 cup. I had intentionally made this is a very thick raspberry compote using the reduction method. If you want a thinner compote, there are other options and I note that in the instructions below. Remove pan from heat. Gently fold in 3 oz (or half ) of the reserved fresh raspberries and 2-3 tsp of Grand Marnier. Immediately pour the raspberry compote into a bowl or a sterilized canning or decorative jar. Serve warm or room temperature. Use the remaining reserved fresh raspberries as a wonderful edible garnish.